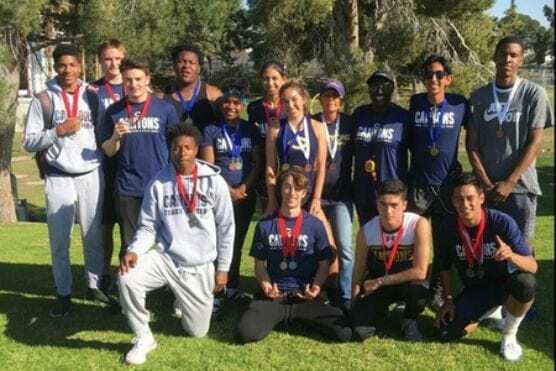 BAKERSFIELD — College of the Canyons won a combined nine events and finished runner-up in six more during a strong showing at the non-conference Bakersfield College Relays on Saturday, March 16. COC’s women’s team dominated the sprint events, while the men’s side had high marks across the board in sprints, distance, jumps and throws. Freshman Tatiana Smith was the top finisher on the women’s side with wins in both the 100m (12.59) and 200m (26.03) events. Sophomore Brianna Helsley continued that trend with a first-place finish in the 400m (1:03.42). Celeste Gonzalez also fared well with a win the 800m (2:31.96) and a runner-up result in the 1,500m (5:22.50). Amanda Finn (20:40.57) and Samantha Bell (21:16.55) finished second and third, respectively, in the 5,000m. Canyons’ men’s side was led by freshman Timothy Sterkel‘s wins in the 800m (1:58.41) and 5,000m (16:08.73). Sophomore Jacob Acosta won the 3,000m steeplechase at a pace of 10:40.13. Freshman Jordan Palmer‘s throw of 14.87m (48’ 9.5″) was the top mark of the day, same for sophomore Delon Buncio‘s time of 57.24 in the 400h. Buncio also scored points by taking third in the triple jump (12.77m / 41′ 10.75″) and fourth in the long jump (6.49m / 21’ 3.5″). Sophomore Andrew Mercado took second in the long jump (6.66m / 21′ 10.25″) and fourth in the high jump (1.70m / 5’7″). Freshman Jacore Johnson was runner-up in the 400m at a time of 48.73. COC’s 4x100m relay team of Buncio, Tony Collier, Adam Burke and Lavell Bailey ran in second at a time of 43.98 to narrowly trail the team from Pasadena City College at 43.20. Likewise, for the 4x400m relay team of Buncio, Troy Chairez, Jeremiah Brown and Johnson which was runner-up at 3:24.76.